The "Customize holidays" feature is convenient for specifying the weekends, holidays and workdays on your calendar, as well as marking any additional dates that you want. The program contains precise, up-to-date information on public holidays for several years to come. 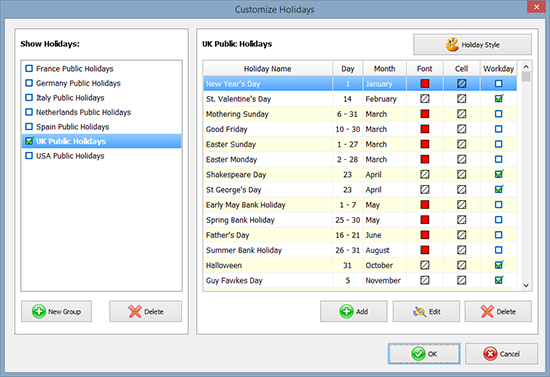 Photo Calendar Creator allows creating additional groups of holidays and editing those already present as well. For even greater effect, you can highlight holidays with the selected font color or background color. Different types of holidays can be marked with different colors. Using the holiday editor, you can quickly and efficiently create a birthday calendar, your own convenient business planner, a religious calendar, or a personal schedule.